Starting today the clock is running towards the submission deadline for the Jazoon’10 Call for Papers. Java and Open Source Experts from all over the world are called upon to actively participate in the steering of the program of Jazoon’10. Proposals for short (20 minutes) and long talks (50 minutes) can be submitted within the scope of the technical sessions until 3 February 2010. Presentations can be held individually or together with a co-speaker. Speakers profit from preferential terms – details to be found here. Proposals for Jazoon Rookie (20 minutes) can be submitted until 4 April 2010. Participating criteria and benefits can be found here. I am making a comeback on this blog with this post, hope to continue doing, what I love doing.. Yesterday, I recreated one of the Visual Library Sample (basically a tutorial based on it at Dzone) using NetBeans 6.7 IDE on Windows XP Professional SP2. 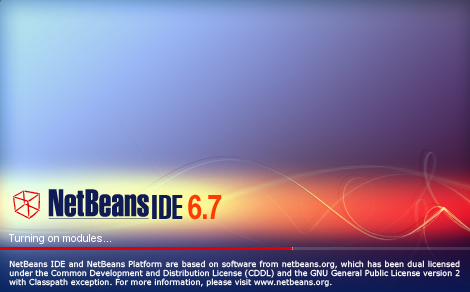 The sample was Java Application that had two JAR’s (present in the platform7 cluster of NetBeans 6.0 IDE) in its classpath. I followed the tutorial and successfully executed the application. 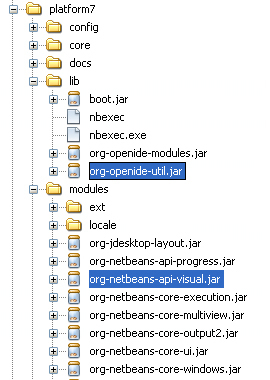 Fortunately, I have NetBeans IDE from 5.5 onwards, so there wasn’t any issue finding the JAR’s and adding them in the application’s classpath. I didn’t knew whether it will work with cluster from higher release or not. Hence, I decided to give it a try by making use of clusters from 6.1, 6.5 and finally, 6.7. Now, removing/adding JAR’s again and again can be boring/cumbersome if you have several releases stored under different hierarchies of your filesystem. So, I looked into the various files created under /nbproject to inspect how these JAR’s being referred. When you right-click Libraries Node and click Add JAR/Folder..
You’re prompted with the dialog for browsing and then, selecting Reference/Absolute Path as per your choice. I selected the platform7 cluster (see above figure) and selected the JAR’s shown in the following figure. 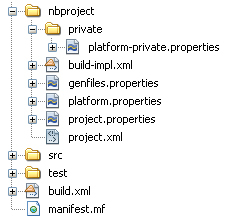 This file contains all the project related properties, that are accessed by build-impl.xml (created from project.xml automatically) for necessary Ant operations. Now, as you can see the path\\to\\cluster is the same in this case. So, I introduce another property that will have the path as value. This way, the referenced JAR’s become dependent on this property. Now, one can also change the value of this property, i.e. 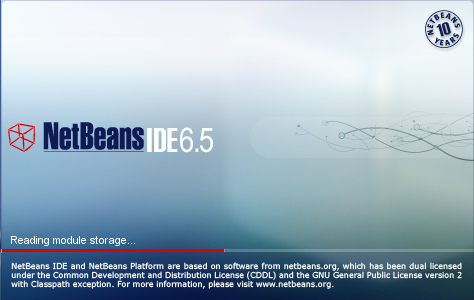 if one is interested in using JAR’s from platform cluster of higher releases of the NetBeans IDE. 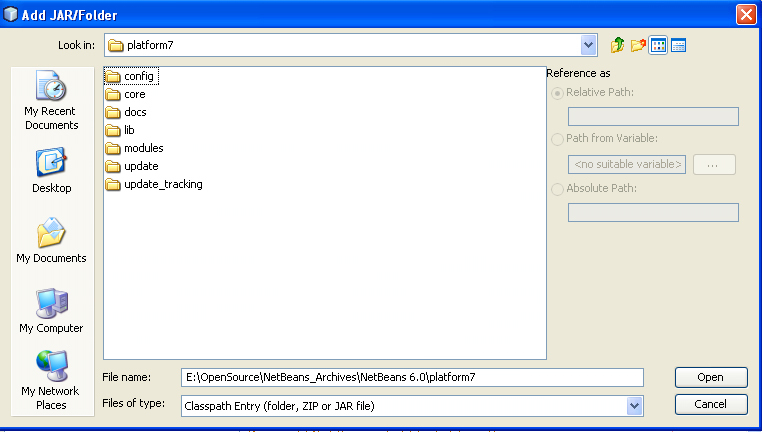 Then, NetBeans will automatically scan the project, to update dependencies. 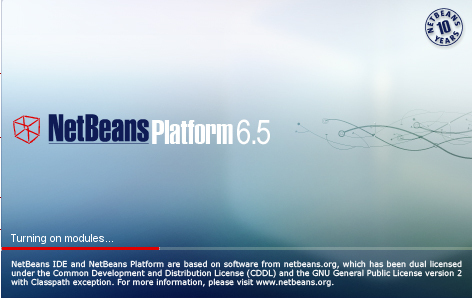 For instance, I opted for platform9 cluster from NetBeans 6.5 IDE. I just made changes at one place, that will be automatically reflected in other properties that depend on it directly/indirectly. However, you need to check your code, once you do these changes, as this might cause warnings on deprecated usage of certain API, when you build your application. Also, if you do any error while editing your project.properties as for this scenario, or any other. You may end up seeing lots of error badges in your code and possibly, get an added menu item (Resolve Reference Problems..) in the project’s context menu.